Tis the season! Every Friday between now and Christmas, I’ll post a gift-guide round-up. Last year I rolled it into my normal Friday Fives, but this year I apparently have my eye on a lot more stuff, so 5 things wasn’t just going to cut it. Here’s the first in the series: Black & White. Have a monochromatic holiday season. I wouldn’t particularly mind if that calendar or glasses showed up under my Christmas tree, which!, by the way!, I’m picking up tomorrow. Today though, I’m spending the day baking with my Mommom. It’s a tradition. We spend one entire day each December baking Christmas cookies (yes, my Jewish grandmother is in charge of baking all the Christmas cookies). I wrote about it last year but shamefully didn’t take any pictures (even though I said “n between baking and decorating I’ll be taking lots of pictures, trying not to get flour all over my camera.” LIES). This year, I will be. We make thousands. I’m so excited to skip a day of work and hang out with the sassiest lady I know, eating sweetened carbohydrates. What are you up to this weekend? YAY! Black and white! Great selection. 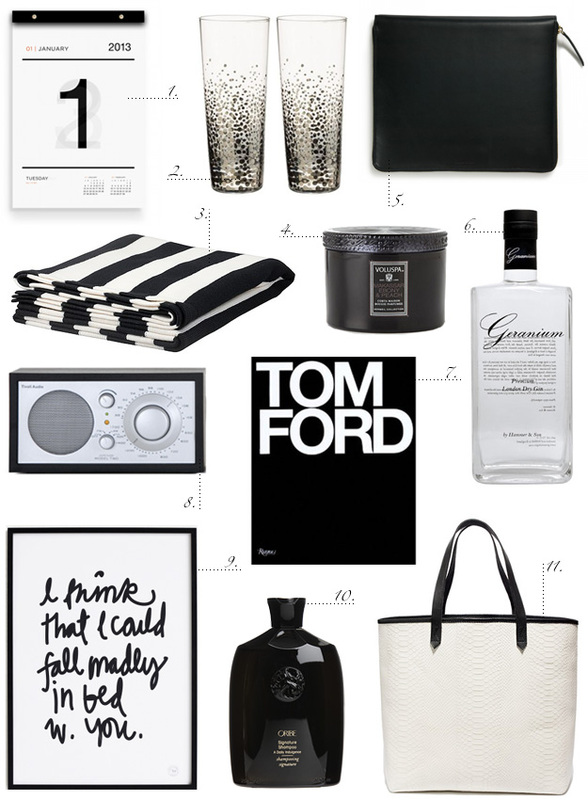 I would especially love the Tom Ford book, Tivoli radio and Therese Sennerholt print….hint hint :) haha! have a lovely weekend. well, i pretty much love everything on here. oh dear my list is getting ridiculously long but i forgot i really wanted that tom ford book. i want that calendar now too. glorious, is this the grandmother who gets cranky without coffee? love it! i wouldn’t kick those glasses, the radio or the print out of my christmas morning bed! can’t go wrong with a bit of b&w! I loooove that brand of candles! Ok, just put all those items in a box and send them over. I’ll have my assistant call your assistant. In all seriousness, have a blast today and the rest of the weekend, Erin! Happy Hanukkah! I’ve got to get some holiday happiness happening in our house, so that’s where you’ll find me, making a general mess and decorating. Cheers! I’ll take one of everything from your round up, pretty please! Love black and white…I will be painting our new bathrooms this weekend, not sure about the exact color yet but it will be some kind of gray. It fits right with today’s black & white theme because so far both rooms are black and white only ;) Have a great weekend! I would like those glasses please and the shampoo and the tote, so that takes care of my list! Thanks! with the exception of the ikea blanket (only because I already own it!) I want ALL OF THE ABOVE!!! esp. that print! well done erin!